The IT Department philosophy at the Department of Labor, Licensing, and Regulation for the State of Maryland is "Keep Infrastructure Simple and Easy to Manage." With this in mind, adapting to new state and federal requirements without reinventing the wheel or adding additional taxpayer cost is a constant challenge. GoAnywhere delivers at every turn for the State of Maryland's Department of Labor, Licensing, and Regulation (DLLR). The main challenge for DLLR was transferring sensitive data in a secure and reliable fashion. In addition, each DLLR "trading partner" required different file formats such as fixed width, Excel, CSV or the increasingly popular XML format. It was becoming very difficult to immediately develop and implement an efficient and reliable process for the growing number of new daily tasks. Manually handling these multiple file transfers left little time for training staff on new software and procedures. 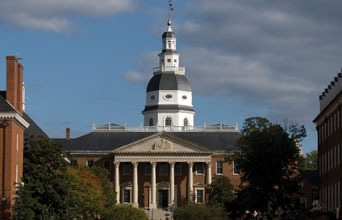 The evident need for an automated and secure managed file transfer solution came around the same time as a new Maryland State law. The new law would require DLLR Mortgage Lending licensees to register with a central federal agency. This new, high-visibility requirement was already on top of the many unique information transfer requests for other private entities and public agencies. Before the installation of GoAnywhere, DLLR developers manually downloaded and uploaded the Excel, CSV or fixed formatted files between the IBM i and their desktop computers. Performing these manual tasks across different PC's and various platforms consumed DLLR IT staff time when they could be focused on other productive development tasks. In addition, there were no central tracking or logging mechanisms recording completed requests, if a recipient received a file, or if a developer even sent the correct file. Attempts to go back and determine the source of an error were next to impossible. Of the options on the market, GoAnywhere met all the DLLR's requirements. GoAnywhere was easy and straightforward to implement and use. The ability to securely automate their processes natively from the IBM i allowed the development staff to return their focus to their regular development tasks. GoAnywhere was selected over other products because, it could restart failed transfers and it easily 'sliced & diced' data between DLLR's backend DB2 database and the many file formats used by DLLR's trading partners; especially XML formatted files. GoAnywhere has increased DLLR's productivity. Adaptability in an enterprise class application is not always expected. Pursuant to requirements under a federal law passed in 2008 and conforming Maryland legislation passed in 2009, Maryland uses the Nationwide Mortgage Licensing System (NMLS), a web-based system, that allows state licensed mortgage companies and loan officers to apply for, amend, update or renew a license online for all participating state agencies using a single set of uniform applications. All mortgage licensees would now submit license applications and/or registrations to NMLS on a daily basis. The new requirements stipulated vast amounts of time-sensitive licensing data be sent securely in XML format. Required to comply with new laws and regulations, many organizations scrambled to meet these requirements. With just a few clicks and defining some GoAnywhere settings, the new data transmission requirements were not an issue for DLLR. GoAnywhere continues to perform for DLLR. The ease of use and flexibility of the application to perform so many tasks continues to provide greater return on their investment. Not only does GoAnywhere automate the data translation and transfers, it monitors itself and sends email notifications after each complete or failed transfer; not only to the DLLR development staff, but also to the internal customers and trading partners. This confirmation gives everyone confidence that the business tasks are running flawlessly.